Coverage: Live text commentary and report on the BBC Sport website. Gareth Bale says Real Madrid can still win the La Liga title even though they go into Saturday's El Clasico 10 points behind opponents Barcelona. Barca are unbeaten in 39 league and cup games and are seeking the double over fierce rivals Real, having beaten them 4-0 at the Bernabeu on 21 November. 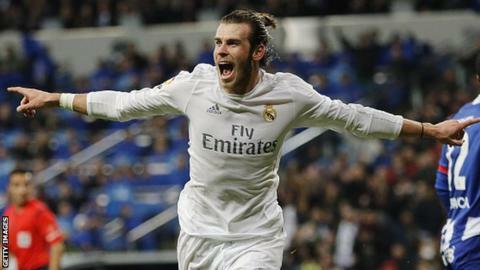 "I think everything is possible in football," said Bale, who said he feels more settled at Real than last season. "Last season I didn't play to anywhere near to my potential." Bale, signed from Tottenham in September 2013, scored 13 times in 31 La Liga appearances as Real finished two points behind champions Barca last season. This season, the Wales international has managed 15 league goals in 18 appearances during an injury interrupted campaign for third-placed Real with eight games to go. "It was important for me to keep working hard, to keep fighting. It is difficult playing in a foreign country," said Bale, 26. "I've felt more settled, more involved in the team this year and I think that has shown in performances on the pitch. "It's good to have a bad season. You really do learn a lot about yourself and I feel this season I took [what happened] last season on board. "I understand the game a lot more over here and I hope there is a lot still more to come in the future." On this season's title race in Spain, Bale added: "We're 10 points behind, but we will keep fighting until it is impossible. "On Saturday, we can get to within seven points of them and you never know what might happen next."